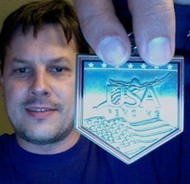 5th Place Medal - 2011 National Championships! 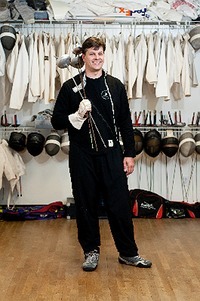 Thomas Knowles is the Director of Fencing, Martial Arts and Music at the Collierville Arts Academy. He has been teaching people how to wield weapons since 1991 and he estimates that he has probably taught more than 3,000 people how to fence over the years. As an Adjunct Professor at the University of Memphis, Coach Knowles teaches the Modern Fencing and Padded Weapons classes: both electives. In addition to the for-credit fencing classes, Coach Knowles taught the non-credit Continuing Education Community Fencing class for the University of Memphis for many years. 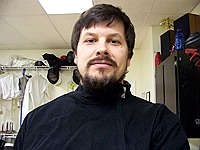 He has been a member of the US Fencing Association, US Fencing Coaches Association, and the US Chanbara Federation. 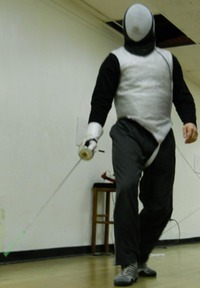 Coach Knowles is an active competitor in the Modern Fencing arena. In March 2011, he won 1st place in Foil and Epee in the Tennessee Division Fencing Championship, qualifying to compete in the annual US National Fencing Championships in July 2011. During the Championships, Mr. Knowles strove mightily over four days of intense fencing, attaining his best results to date: 12th in the nation in Division II Men's Epee, 8th in the nation in Division III Men's Epee, 15th in the nation in Veteran's 40 Men's Foil, and 5th in the nation in Veteran's 40 Men's Epee. Locally, Coach Knowles is working to develop Fencing as a viable and popular youth sport in the MidSouth region. He is the Fencing Coach for the 2011 Tennessee State Epee Team Champions: Christian Brothers High School (Memphis) as well as coach of the fencing programs for St. George's School in Collierville, TN, and the Memphis Home Education Association (MHEA). Master Knowles also oversees and conducts the Martial Arts classes at CAA. His focus is certainly on children and youth but also beginners at all ages. He has a personal belief that within each of us is an inner hero that is normally dormant but accessible if the need arises. Developing the attributes and abilities that enable the proper and just activation of the hero-persona is not a common pursuit in a contemporary society of quick-fixes and 'give-it-to-me-now' mindsets. Master Knowles seeks to provide opportunities to reveal and release the inner hero within each of us in the hopes that the world can thereby become a better place. It is his personal opinion that there are already plenty of villains. Mr. Knowles also teaches music. As a young musician he has played piano, french horn, trumpet, and guitar. After studying classical guitar under John Stover and then Lily Afshar at the University of Memphis, Mr. Knowles earned a Bachelor of Music with an emphasis on Recording Technology. Mr. Knowles has worked as a recording engineer in the music industry, a volunteer and staff member at public television, a video editor for commercial production houses, and editor for live broadcast news. His theatre background is extensive and includes work on productions for high schools, colleges, and universities. He has also worked in outdoor theatre with productions of Blue Jacket and Annie Get Your Gun in Xenia, Ohio. Also, he has been a music director/worship leader at several local churches and is a prolific Christian singer/songwriter. He feels most truly blessed to be married for over twenty-five years to an incredible and beautiful lady and is the father of four exceptional children.